Lent is right around the corner. It's a time of self-reflection and remembering, a time of repentance and prayer, a time of giving. But instead of making it a time of negativity and rules and taking away (sacrifice) for kids, try to make it a time of inspiration. Instead of giving something up, try giving something else. Talk to kids about being thankful for the gifts God gives by doing small (or random) acts of charity, having special prayer times and praying for other people. Make it a time to read special books about Jesus' ministry through His resurrection. Children younger than three can be told that Jesus is alive and with us today. Yeah!! Preschool children will appreciate a simple explanation that Jesus died on a cross, was buried in a tomb, and then rose on Easter Sunday so we can be with Him in heaven. Hooray! 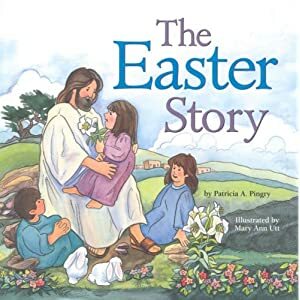 If you'd like a book for preschoolers try The Easter Story. Kids this age will not benefit from having to put a toy away during Lent. They'll give it up because they're told they have to but they won't be doing it willingly as they don't understand the concept of sacrifice. Younger elementary children can hear stories from the gospels without going into too much detail. They will ask questions about things they're curious about or don't understand and you can answer them honestly but simply. 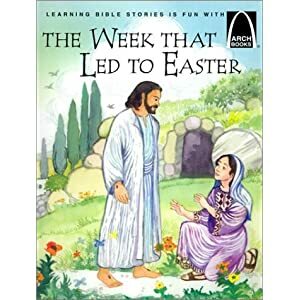 If you're looking for a book for this age group try the Arch book, The Week that Led to Easter. Kids this age won't yet benefit from having to sacrifice something either. They understand sharing or giving but not sacrifice. Older elementary children can be exposed to more particulars of Maundy Thursday and Good Friday. 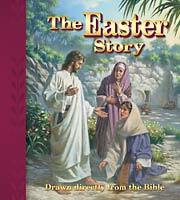 A good book for kids this age is The Easter Story as it is drawn directly from the Bible. They're beginning to understand and can participate in self-reflecting activities, if guided, and may benefit from giving something up for Lent. They should also be able to make special prayer requests.